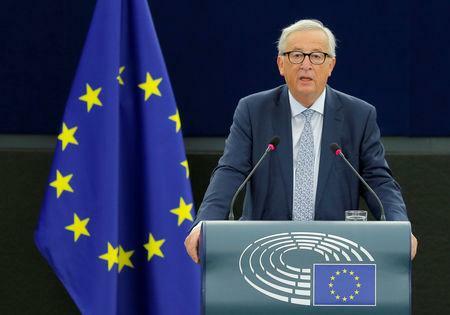 STRASBOURG (Reuters) - European Commission head Jean-Claude Juncker on Wednesday renewed a pledge of close trade and security ties with Britain after Brexit but said the European Union would not compromise on key withdrawal terms. Delivering his annual state-of-the-union speech to the European Parliament, Juncker said the EU will not allow Britain to participate only in some parts of the bloc's single market after Brexit without honoring all of the rules. "This is why we want to find solutions that prevent a hard border in Northern Ireland," he said, adding the EU will stand in solidarity with Ireland.